This week, we have an excellent cochlear implant surgical case study to share. As part of our MED-EL Surgical Video Library, it’s presented in HD video, so you’ll have a clear view of the surgical techniques and anatomical structures—including the mastoidectomy, posterior tympanotomy, opening of the round window membrane, and insertion of the electrode array. In this surgical case study, Prof. Dr. Paul Van de Heyning demonstrates his surgical techniques for the CONCERTO PIN Cochlear Implant. 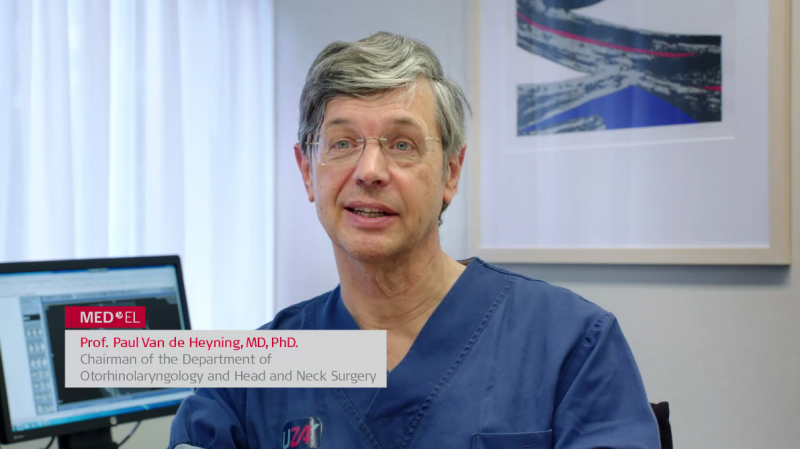 Prof. Dr. Van de Heyning is the Chairman of the Department of Otorhinolargngology and Head and Neck Surgery at the Antwerp University Hospital. The female patient, 59 years old, experienced hearing loss from an unknown cause, which progressed to profound bilateral sensorineural hearing loss. For this patient, Prof. Dr. Van de Heyning utilizes the CONCERTO PIN Cochlear Implant with a FLEX 28 electrode array. In this video, you’ll see Prof. Dr. Van de Heyning demonstrate a minimally invasive surgical technique, including small incision and the use of a PIN implant with a tight sub-periosteal pocket. He also demonstrates his technique for drilling an electrode lead channel, which protects the electrode lead from external impacts. Prof. Dr. Van de Heyning performs structure preservation techniques, including the use of intraoperative steroids, round window approach, and slow electrode array insertion. Want more surgical case studies like this? Check out the MED-EL Surgical Video Library for access to all of our video case studies! We’ll be posting more cochlear implant case studies here on our MED-EL Professionals Blog—don’t forget to subscribe!